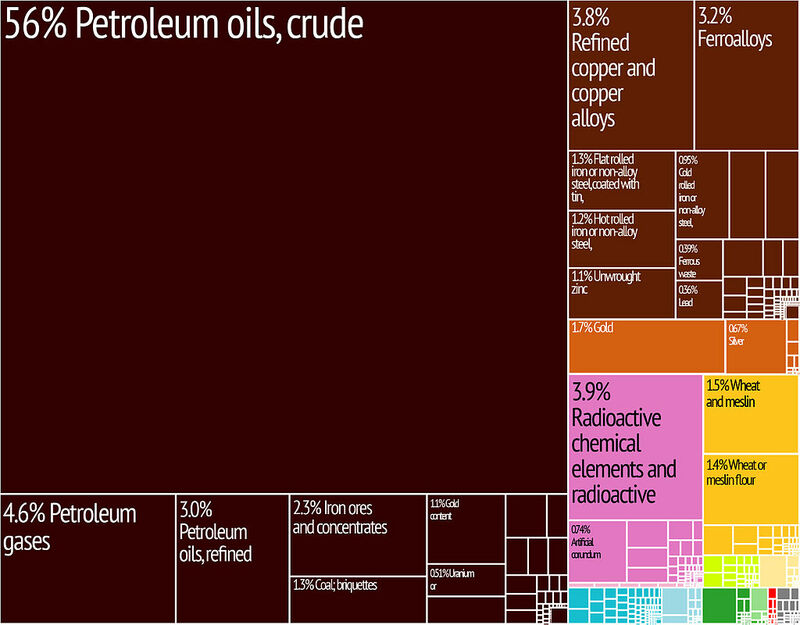 A proportional representation of Kazakhstan’s exports. Kazakhstan has the largest and strongest performing economy in Central Asia. Supported by rising oil output and prices, Kazakhstan’s economy grew at an average of 8% per year until 2013, before suffering a slowdown in 2014 and 2015 Kazakhstan was the first former Soviet Republic to repay all of its debt to the International Monetary Fund, 7 years ahead of schedule. Kazakhstan’s economy grew by 4.6% in 2014. The country experienced a slowdown in economic growth from 2014 sparked by falling oil prices and the effects of the Ukrainian crisis The country devalued its currency by 19% in February 2014. Another 22% devaluation occurred in August 2015. Kazakhstan’s fiscal situation is stable. The government has continued to follow a conservative fiscal policy by controlling budget spending and accumulating oil revenue savings in its Oil Fund – Samruk-Kazyna. The global financial crisis forced Kazakhstan to increase its public borrowing to support the economy. Public debt increased to 13.4 per cent in 2013 from 8.7 per cent in 2008. Between 2012 and 2013, the government achieved an overall fiscal surplus of 4.5 per cent. 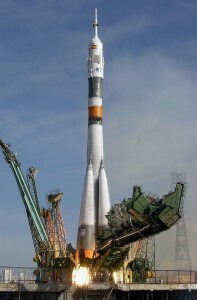 Baikonur Cosmodrome is the world’s oldest and largest operational space launch facility. Kazakhstan weathered the global financial crisis well, by combining fiscal relaxation with monetary stabilisation. In 2009, the government introduced large-scale support measures such as the recapitalisation of banks and support for the real estate and agricultural sectors, as well as for small and medium enterprises (SMEs). The total value of the stimulus programs amounted to $21 billion, or 20 per cent of the country’s GDP, with $4 billion going to stabilise the financial sector. During the global economic crisis, Kazakhstan’s economy contracted by 1.2% in 2009, while the annual growth rate subsequently increased to 7.5% and 5% in 2011 and 2012, respectively. In September 2002, Kazakhstan became the first country in the CIS to receive an investment grade credit rating from a major international credit rating agency. As of late December 2003, Kazakhstan’s gross foreign debt was about $22.9 billion. Total governmental debt was $4.2 billion, 14% of GDP. There has been a reduction in the ratio of debt to GDP. The ratio of total governmental debt to GDP in 2000, was 21.7%; in 2001, it was 17.5%, and in 2002, it was 15.4%. Economic growth, combined with earlier tax and financial sector reforms, has dramatically improved government finance from the 1999 budget deficit level of 3.5% of GDP to a deficit of 1.2% of GDP in 2003. Government revenues grew from 19.8% of GDP in 1999 to 22.6% of GDP in 2001, but decreased to 16.2% of GDP in 2003. In 2000, Kazakhstan adopted a new tax code in an effort to consolidate these gains. On 29 November 2003, the Law on Changes to Tax Code which reduced tax rates was adopted. The value added tax fell from 16% to 15%, the social tax, from 21% to 20%, and the personal income tax, from 30% to 20%. On 7 July 2006, the personal income tax was reduced even further to a flat rate of 5% for personal income in the form of dividends and 10% for other personal income. Kazakhstan furthered its reforms by adopting a new land code on 20 June 2003, and a new customs code on 5 April 2003. Energy is the leading economic sector. Production of crude oil and natural gas condensate from the oil and gas basins of Kazakhstan amounted to 79.2 million tonnes (77.9 million long tons) in 2012 up from 51.2 million tonnes (50.4 million long tons) in 2003. Kazakhstan raised oil and gas condensate exports to 44.3 million tons in 2003, 13% higher than in 2002. Gas production in Kazakhstan in 2003, amounted to 13.9 billion cubic metres (490 billion cubic feet), up 22.7% compared to 2002, including natural gas production of 7.3 billion cubic metres (260 billion cubic feet). Kazakhstan holds about 4 billion tonnes (3.9 billion long tons) of proven recoverable oil reserves and 2,000 cubic kilometres (480 cubic miles) of gas. According to industry analysts, expansion of oil production and the development of new fields will enable the country to produce as much as 3 million barrels (480,000 m3) per day by 2015, and Kazakhstan would be among the top 10 oil-producing nations in the world. Kazakhstan’s oil exports in 2003, were valued at more than $7 billion, representing 65% of overall exports and 24% of the GDP. Major oil and gas fields and recoverable oil reserves are Tengiz with 7 billion barrels (1.1 billion cubic metres); Karachaganak with 8 billion barrels (1.3 billion cubic metres) and 1,350 cubic kilometres (320 cubic miles) of natural gas; and Kashagan with 7 to 9 billion barrels (1.4 billion cubic metres). Kazakhstan instituted an ambitious pension reform program in 1998. As of 1 January 2012, the pension assets were about $17 billion (KZT 2.5 trillion). There are 11 saving pension funds in the country. The State Accumulating Pension Fund, the only state-owned fund, was privatised in 2006. The country’s unified financial regulatory agency oversees and regulates the pension funds. The growing demand of the pension funds for quality investment outlets triggered rapid development of the debt securities market. Pension fund capital is being invested almost exclusively in corporate and government bonds, including government of Kazakhstan Eurobonds. The government of Kazakhstan is studying a project to create a unified national pension fund and transfer all the accounts from the private pension funds into it. The banking system of Kazakhstan is developing rapidly and the system’s capitalisation now exceeds $1 billion. The National Bank has introduced deposit insurance in its campaign to strengthen the banking sector. Due to troubling and non-performing bad assets the bank sector yet is at risk to lose stability. Several major foreign banks have branches in Kazakhstan, including RBS, Citibank, and HSBC. Kookmin and UniCredit have both recently entered the Kazakhstan’s financial services market through acquisitions and stake-building. In 2012, Kazakhstan attracted $14 billion of foreign direct investment inflows into the country at a 7% growth rate making it the most attractive place to invest out of CIS nations. During the first half of 2013, Kazakhstan’s fixed investment increased 7.1% compared to the same period in 2012 totalling 2.8 trillion tenge ($18 billion US dollars). In 2013, Aftenposten quoted the human-rights activist and lawyer Denis Jivaga as saying that there is an “oil fund in Kazakhstan, but nobody knows how the income is spent”. Kazakhstan’s economy grew at an average of 8% per year over the past decade on the back of hydrocarbon exports. 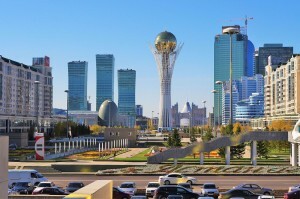 Despite the lingering uncertainty of the global economy, Kazakhstan’s economy has been stable. GDP growth in January–September 2013 was 5.7%, according to preliminary calculations of the Ministry Economy and Budget Planning. From January to September 2014 Kazakhstan’s GDP grew at 4%. According to the results from the first half of the year, the current account surplus is $6.6 billion, a figure two times higher than that of the first half of 2013. According to the Chairman of the National Bank of Kazakhstan, Kairat Kelimbetov, the increase was caused by a trade surplus of 17.4 percent, or approximately USD 22.6 billion. The overall inflation rate for 2014 is forecasted at 7.4 percent. Agriculture accounts for approximately 5% of Kazakhstan’s GDP. Grain, potatoes, vegetables, melons and livestock are the most important agricultural commodities. Agricultural land occupies more than 846,000 square kilometres (327,000 sq mi). The available agricultural land consists of 205,000 square kilometres (79,000 sq mi) of arable land and 611,000 square kilometres (236,000 sq mi) of pasture and hay land. Over 80% of the country’s total area is classified as agricultural land, including almost 70% occupied by pasture. Its arable land has the second highest availability per inhabitant (1.5 hectares). Chief livestock products are dairy products, leather, meat, and wool. The country’s major crops include wheat, barley, cotton, and rice. Wheat exports, a major source of hard currency, rank among the leading commodities in Kazakhstan’s export trade. In 2003 Kazakhstan harvested 17.6 million tons of grain in gross, 2.8% higher compared to 2002. Kazakh agriculture still has many environmental problems from mismanagement during its years in the Soviet Union. Some Kazakh wine is produced in the mountains to the east of Almaty. Kazakhstan is thought to be one of the places that the apple originated, particularly the wild ancestor of Malus domestica, Malus sieversii. It has no common name in English, but is known in its native Kazakhstan as alma. The region where it is thought to originate is called Almaty: “rich with apple”. This tree is still found wild in the mountains of Central Asia, in southern Kazakhstan, Kyrgyzstan, Tajikistan and Xinjiang in China. Kazakhstan has an abundant supply of accessible mineral and fossil fuel resources. Development of petroleum, natural gas, and mineral extractions, has attracted most of the over $40 billion in foreign investment in Kazakhstan since 1993 and accounts for some 57% of the nation’s industrial output (or approximately 13% of gross domestic product). According to some estimates, Kazakhstan has the second largest uranium, chromium, lead, and zinc reserves, the third largest manganese reserves, the fifth largest copper reserves, and ranks in the top ten for coal, iron, and gold. It is also an exporter of diamonds. Perhaps most significant for economic development, Kazakhstan also currently has the 11th largest proven reserves of both petroleum and natural gas. In total, there are 160 deposits with over 2.7 billion tonnes (2.7 billion long tons) of petroleum. Oil explorations have shown that the deposits on the Caspian shore are only a small part of a much larger deposit. It is said that 3.5 billion tonnes (3.4 billion long tons) of oil and 2.5 billion cubic metres (88 billion cubic feet) of gas could be found in that area. Overall the estimate of Kazakhstan’s oil deposits is 6.1 billion tonnes (6.0 billion long tons). However, there are only 3 refineries within the country, situated in Atyrau, Pavlodar, and Shymkent. These are not capable of processing the total crude output so much of it is exported to Russia. According to the US Energy Information Administration Kazakhstan was producing approximately 1,540,000 barrels (245,000 m3) of oil per day in 2009. On 17 October 2013, the Extractive Industries Transparency Initiative (EITI) accepted Kazakhstan as “EITI Compliant”, meaning that the country has a basic and functional process to ensure the regular disclosure of natural resource revenues. 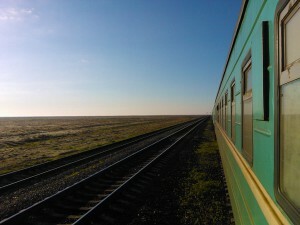 Most cities are connected by railroad; high-speed trains go from Almaty (the southernmost city) to Petropavl (the northernmost city) in about 18 hours. The banking industry of the Republic of Kazakhstan experienced a pronounced boom and bust cycle over 2000s decade. After several years of rapid expansion in the mid-2000s, the banking industry collapsed in 2008. Several large banking groups, including BTA Bank J.S.C. and Alliance Bank, defaulted soon after. Since then, the industry has shrunk and been restructured, with system-wide loans dropping to 39% of GDP in 2011 from 59% in 2007. Although the Russian and Kazakh banking systems share several common features, there are also some fundamental differences. Banks in Kazakhstan have experienced a lengthy period of political stability and economic growth. Together with a rational approach to banking and finance policy, this has helped push Kazakhstan’s banking system to a higher level of development. Banking technology and personnel qualifications alike are stronger in Kazakhstan than in Russia. On the negative side, past stability in Kazakhstan arose from the concentration of virtually all political power in the hands of a single individual – the key factor in any assessment of system or country risk. The potential is there for serious disturbances if and when authority passes into new hands. The government has set the goals that a transition to the Green Economy in Kazakhstan occur by 2050. The green economy is projected to increase GDP by 3% and create more than 500 thousand new jobs. As of 30 September 2012, foreign investors had placed a total of $177.7 billion in Kazakhstan. 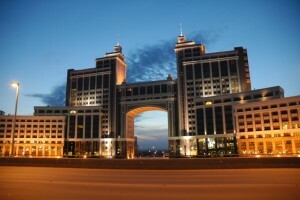 According to the US State Department, Kazakhstan is widely considered to have the best investment climate in the region. In 2002 the country became the first sovereign in the former Soviet Union to receive an investment-grade credit rating from an international credit rating agency. Foreign direct investment (FDI) plays a more significant role in the national economy than in most other former Soviet republics. Sir Suma Chakrabarti, the President of the European Bank of Reconstruction and Development (EBRD), co-chaired the Kazakhstan Foreign Investors’ Council with President Nursultan Nazarbayev. In May 2014, the EBRD and government of Kazakhstan created the Partnership for Re-Energizing the Reform Process in Kazakhstan to work with international financial institutions to channel US$2.7 billion provided by the Kazakh government into important sectors of Kazakhstan’s economy. The partnership will boost investment and drive forward reforms in the country. As of May 2014, Kazakhstan attracted $190 billion in gross foreign investments since its independence in 1991 and it leads the CIS countries in terms of FDI attracted per capita. One of the factors that attract foreign direct investments is country’s political stability. According to the World Bank’s report, Kazakhstan is among the top 40% of countries in the world that are considered the most politically stable and free of violence. Kazakhstan also received high ratings in a survey conducted by Ernst & Young in 2014. 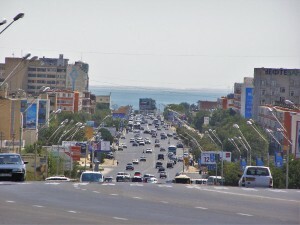 According to EY’s 2014 Kazakhstan Attractiveness Survey, “Investor confidence in Kazakhstan’s potential is also at an all-time high with 47.3% of respondents expecting Kazakhstan to become increasingly attractive over the next three years.” The high level of economic, political and social stability and Kazakhstan’s competitive corporate tax rate were the primary reasons mentioned for its attractiveness. In October 2014, Kazakhstan introduced its first overseas dollar bonds in 14 years. Kazakhstan issued $2.5 billion of 10- and 30-year bonds on 5 October 2014, in what was the nation’s first dollar-denominated overseas sale since 2000. Kazakhstan sold $1.5 billion of 10-year dollar bonds to yield 1.5 percentage points above midswaps and $1 billion of 30-year debt at 2 percentage points over midswaps. The country drew bids for $11 billion. Kazakhstan achieved its goal of entering the top 50 most competitive countries in 2013, and has maintained its position in the 2014–2015 World Economic Forum Global Competitiveness Report that was published at the beginning of September 2014. Kazakhstan is ahead of other states in the CIS in almost all of the report’s pillars of competitiveness, including institutions, infrastructure, macroeconomic environment, higher education and training, goods market efficiency, labour market development, financial market development, technological readiness, market size, business sophistication and innovation, lagging behind only in the category of health and primary education. The Global Competitiveness Index gives a score from 1 to 7 in each of these pillars, and Kazakhstan earned an overall score of 4.4. The housing market of Kazakhstan has grown since 2010. In 2013, the total housing area in Kazakhstan amounted to 336.1 million square metres (3,618 million square feet). The housing stock rose over the year to 32.7 million squares, which is nearly an 11% increase. Between 2012 and 2013, the living area per Kazakh citizen rose from 19.6 to 20.9 square metres (211 to 225 square feet). The urban areas concentrate 62.5 percent of the country’s housing stock. The UN’s recommended standard for housing stands at 30 square metres (320 square feet) per person. Kazakhstan will be able to reach the UN standards by 2019 or 2020, if in the medium term the housing growth rate remains within 7 percent. On 11 November 2014, President of Kazakhstan Nursultan Nazarbayev delivered an unexpected state-of-the-nation address in Astana at an extended session of the Political Council of the Nur Otan party, introducing a “Nurly Zhol” (Bright Path), a new economic policy that implies massive state investment in infrastructure over the next several years. The “Nurly Zhol” policy is accepted as preventive measures needed to help steer the economy towards sustainable growth in the context of the modern global economic and geopolitical challenges, such as the 25%-reduction in the oil price, reciprocal sanctions between the West and Russia over Ukraine, etc. The policy embraces all aspects of economic growth, including finances, industry and social welfare, but especially esemphasises investments into the development of infrastructure and construction works. Given recent decreases in revenues from the export of raw materials, funds will be used from Kazakhstan’s National Fund. In 2005, the World Bank listed Kazakhstan as a corruption hotspot, on a par with Angola, Bolivia, Kenya, Libya and Pakistan. In 2012, Kazakhstan ranked low in an index of the least corrupt countries and the World Economic Forum listed corruption as the biggest problem in doing business in the country. The Federal Bureau of Investigation and the Kazakh Anti-Corruption Agency signed a Mutual Legal Assistance Treaty in February 2015.